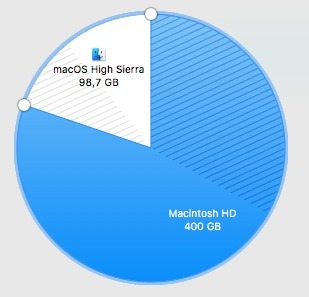 The main question: I have two partitions in my HD (the original "Macintosh HD" and a new one "macOS"). If in "macOS" I have the OSX running – and actually booted in it –, can I erase the "Macintosh HD" partition or will there be problems? The situation: I need it because suddenly my "Macintosh HD" stopped booting, every time I turned my mac on, it stopped in the first loading screen. I used the Recovery Mode and tried to restore the partition, but no success on it. I then reinstalled OSX in a new partition ("macOS"), so that I could launch my OS successfully. In this new partition, everything is ok. The problem is: right now, I have a 400GB partition not working. I am not sure if the original Macintosh partition carries some important stuff for the launch system or if it can be erased (since I have another running partition). You'll be in the erase since Disk Utility can't fix things. You will lose any partition data, EFI customizations, recovery HD when you erase and the installer will put things right again and drop the OS and an installer log that you can review in case there are still hardware or other errors. Not the answer you're looking for? Browse other questions tagged macos hard-drive partition recovery internet-recovery . Why does Mac OS X 10.11 ignore new partition size? How can I make my Mac partition bootable again?